(01-31-2019, 09:38 AM)Carolina_Mountain_Mustangs Wrote: Welcome to the forum from North Carolina. Looks like you have picked a good bone to start with. I would rather have a car that has never been painted than a shiny one full of filler and rust. There are a few areas on these cars that are prone to rust. They never dipped these cars in primer. They did get two coats of epoxy primer. Depending on how early your car was might be red oxide primer but if built in Dearborn will be gray. Areas to look at for rust. #1: The cowl at base of windshield. The windshield lays on the cowl and there is a gap between the glass and metal. Trash collects in there and so rust is likely. #2: Inside the cowl on an AC car you have only one opening going into the cabin that is above the heater box on the R.H. side. Mice, chipmunks and such love to build nests inside the cowl and the heater box. To stop them when you have rebuilt your car you need to add mesh wire under the cowl vents and between the cowl and heater box. You can look inside the car at the bottom of the cowl and if you see water marks or rust you have rust holes in the cowl. Simply washing the car causes this to happen. #3: Rust around the tail lights. The tail lights bolt in from the inside and have a soft rubber gasket. There is a space that holds water and again simply washing the car causes rust. They did not do a good job spraying paint on the inside. #4: Trunk floor and drop off to the quarter panels. This holds water if the tail lights leak and so feeds the rust. #5: You should pull the interior out and look for your build sheet during the process. I have seen under the carpet, under the sound deadening, stuffed into the back seat springs, also stuffed in the seat riser welded to the floor. This sheet tells you everything used to assembly your car down the line. Now that you have the interior out if the cowl has leaked it eats up the front floors. If you have leaks from the vinyl roof then rear floors and under seat will rust. #6: On vinyl roof cars Ford did not spray top coats of color on the roof only the primer so not much protection. Leaks start around the holes for the fasteners and clips and the rust begins to creep out. Also around the rear windows and roof rails are subject to holding water and spreading the rust. Your car looks correct for the vinyl roof. You can order a Marti report to get all the details on your car. One thing on your car is the Protection Group. That is the side strips, and I think the bumper guards were part of that in 71. Not sure if you got the locking spare tire in 71 I think not. I need the side strips if you are going to leave them off the build. Now to get one of these to handle you have the right engine. The 302 is the lightest of the V-8s that were available. You can get lots of power out of it tons of SMF performance items out there. The chassis on these of course flexes, all do even your M. You can add sub frame connectors, better springs and shocks, different front upper and lower control arms, drop spindles, roll cage. Just depends on how serious you want to get. Holman Moody took a unitized body Fairlane and won a class at LaMans in 1965 I believe. You can make any car handle with the right parts. The modifications to the Shelby Mustangs were developed by Holman Moody also. Simple, easy to do and not expensive. When you start to take the car apart do not think you can just go buy and new part. Some parts are not available so be careful and take lots of pics and bag and tag everything. The coupe will make the best handling of the three bodies due to having a shorter roof than the fastback and is probably stiffer. I was building a convertible for track days I figured that no top lowered the center of gravity and would be better. Roll cage is required so that would stiffen it right up. Hope it works I get it right some times, lol. BTW my son is head inspector at the BMW plant in Spartanburg, S.C. he is on the six line. He said he would never buy a BMW they have so many quality issues, lol. He drives a 2018 GT Mustang. At one time BMW hired a bunch of Jack Roush's mechanics to come to BMW and work in the plant to do repairs. They had over 5,000 cars in the lot that needed to come back into the plant and be fixed. They actually crush some cars that they cannot figure out what is wrong when brand new. If you knew the profit margin on a BMW you would pass out. $14,000 for and X-6 out the door. That video is amazing. Do you have any links or more info on the build of that gt350? Also I will let you know about the trim after I get into the build. Thanks. Welcome from Amsterdam, the NL’s. Looks like a great project, good luck! Dope, from your close up pictures I see what you are referring to. 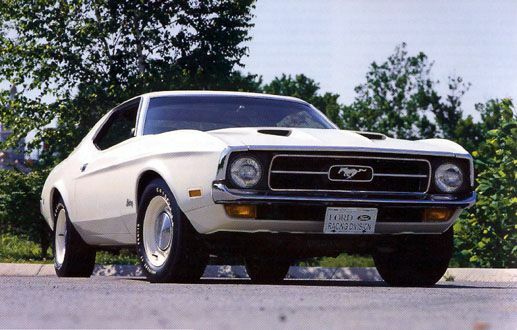 There was only one version OE vinyl roof for the hardtop Mustang for the 71-73 's. Just guessing, is it possible that some time during the past 48 years the vinyl top was replaced and some of the original mouldings were damaged or misplaced? If not and it is a Dealer or aftermarket top, that has to be one of the closest I have ever seen to matching the production installed top. Definitely a difference in the OE mouldings and the ones you have circled. At this point I would invest in a Marti report and then you would have pretty good ideal of how your car was equipped when built. After all it's just money! Mirrors definitely are not. Ford never offered a chrome swivel head sport mirror as an option. Factory sport mirrors were a painted body color and had a remote on the driver's side door panel. Wheels are probably factory, didn't have a good side view to really examine them. If they are painted body color, then they originally only had the center dog dish or "poverty" caps. The video of the GT-350 was posted on our mustang clubs facebook page and I just moved to here, no more info. Some of the race motors have very high compression 13 - 1 or more. My old boss man use to build them and use 327 chevy pop up pistons and hand work the domes and not use head gaskets to get extremely high compression. They you have to use the very expensive fuel. His engines would go over 10,000 rpm. When they blew there was not much left, lol. Here is a picture of the Lower Valance Guards that Secluff mentioned. They are hens teeth a one year only thing and not many out there. Has to have a bracket to mount them. They go from bumper down to the bottom of the valance panel in the front. I need on of the rubber strips and the mounting brackets. Going to put on a 72 even though they did not come on it. Welcome from Oregon. Have fun with your car. Looking for advice on suspension and disk brake upgrades for my 71 coupe 302 ac. Again this will be a daily driver so what I want is to be able to go to an auto parts store or dealer and be able to buy oe/oem replacement parts. The parts can be from any car/manufacture and I would prefer it to be bolt on but I don’t mind doing metal work for it initially just as long as the end result is parts from a specific car. This theory goes to both suspension and brakes. I’ve done some searching and this is what I’ve found. Let me know if you know any other options. - Rear crown Vic with custom washers. For suspension, I really wanted to do full TCP front and rear but I know if anything breaks, I would have to source the parts through them and hope that they never stop producing it. So I’ve decided to build the best suspensions I can with oem parts. If that’s even an option. Please post any suggestion you have, even if it’s somewhat far fetch. Thanks! !